Hyperbiotics PRO-15: Is It "The Perfect Probiotic"? Hyperbiotics PRO-15: “The Perfect Probiotic” Supplement? Hyperbiotics PRO-15 is a multi-species probiotic supplement in tablet form. It is marketed as “The Perfect Probiotic” for “seeking to promote the balance of beneficial flora on a daily basis or you’re looking to repopulate your probiotic colonies.” It is one of seven products in the Hyperbiotics line. It is also marketed to be 15 times more effective than vegetarian capsules, but what are the details of those claims? What Probiotic Strains are in Hyperbiotics PRO-15? These beneficial bacteria are supplied by Nutraceutix and produced into tablet form using Nutraceutix’s patented LiveBac® and BIO-tract® technologies (discussed below). What are the Other Ingredients in Hyperbiotics PRO-15? The other ingredients at the time of this writing are microcrystalline cellulose, hydroxypropylmethlycellulose, pectin, stearic acid, sodium carbonate, guar gum and turmeric. The stearic acid is a flow agent to make the tablets glide over equipment easier. The sodium carbonate is used to control the pH inside the tablet and around the disintegrating tablet in your intestine. The other ingredients in Hyperbiotics PRO-15 make up the time-release aspects of the tablet. What is the Recommended Dosage of Hyperbiotics PRO-15 and for which conditions or claims? For daily maintenance, 1 tablet per day prior to food is recommended by the manufacturer. For intense therapy, such as after a course of antibiotics, 3 tablets once per day prior to food is recommended by the manufacturer. What are the Pros of Hyperbiotics PRO-15? It contains 15 different species of lactic acid bacteria. The probiotic strains are identity-verified from ATCC culture collections and grown and harvested in Washington State in the US in Nutraceutix’s facility. It contains NO GMO’s, yeast, lactose, soy, iron, gluten, wheat, nuts, chemicals, preservatives, sugar or artificial colors or flavors. It is shelf-stable, and reportedly there will still be viable bacteria (albeit in unknown amounts) at the end of 18 months. Hyperbiotics PRO-15 is produced by Nutraceutix in a GMP (Good Manufacturing Practices) facility in the US. It appears that Nutraceutix handles the growth, manufacturing and packing of all materials and Hyperbiotics merely sells the final products. When questioned, the company says that Hyperbiotics PRO-15 is kosher. 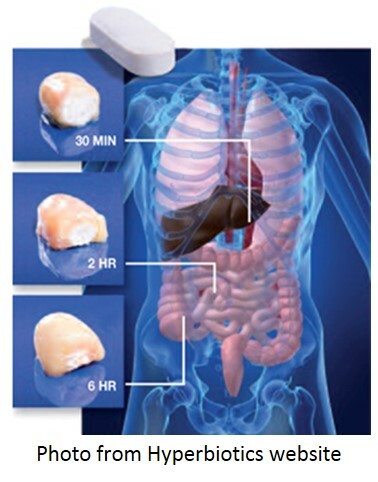 The probiotics are manufactured into tablet form using Nutraceutix’s patented LiveBac® and BIO-Tract® processes. The LiveBac® process utilized nitrogen to quickly cool the tablets to reduce microbe loss from the heat experienced during the tablet-making process. The BIO-Tract® process uses time-release technology with the combination of hydrophilic (water-attracting) agents and pH control agents. Once the tablet encounters liquids in your stomach, it begins a slow breakdown process. Based on laboratory-simulated digestive conditions, the BIO-Tract® process is reported by Nutraceutix to deliver 60% of live, viable bacteria to the intestines instead of the alleged 4% for plain vegetarian capsules with no microbe encapsulation. Note that a digestion model was used and that your results may be different. Additionally, I have some questions about how the study was conducted and will update this page once/if I receive that information. Putting the bacteria in tablet form reduces their exposure to air and moisture. Nutraceutix uses this technology for other supplements, too. Hyperbiotics says that they test for an array of items including physical analysis, potency, culture identity, ingredient identity and the presence of allergens, metals and other contaminants. “Severely helped my IBS / Colitis symptoms. I take 2 pills a day every day, and this has saved me from having to go back to the doctor to get another colonoscopy. If you have IBS or Ulcertive Colitis, give this stuff a try before going on medicine with crazy side effect. What are the Cons of Hyperbiotics PRO-15? Of course, there are some unfavorable reviews of Hyperbiotics PRO-15, too. L. fermentum - Identified as highly antimicrobial and antioxidative. Helps inhibit the growth of harmful bacteria, yeast and other pathogens and has demonstrated clinical efficacy within immune health. L. acidophilus - Creates a fortress of good colonies that helps keep unwanted organisms out of your gut. Studies show that L. acidophilus helps to reduce occasional diarrhea and enhances your immune system and may help to reduce cholesterol levels. Studies have shown that those taking L. acidophilus experienced significantly more relief from their gastrointestinal discomfort than did those taking a placebo. L. casei - Along with L. Acidolphilus, converts lactose into lactic acid, helping those who are lactose intolerant. Helps to encourage the growth of other beneficial bacteria. B. longum - Assists in breaking down carbohydrates and fighting free radicals. Provides potent antioxidant support and helps to reduce the effects of seasonal allergens. When questioned, Hyperbiotics said that the strain is Bl-05. B. lactis - Helps decrease H. pylori and helps the production of the front line cells in your immune system. L. rhamnosus - The leading defense for travelers. Helps reduce occurrences of traveler's diarrhea and food poisoning. L. plantarum - Secretes the oxidant hydrogen peroxide which acts as a weapon to protect your body and must be present for your immune system to function correctly. Creates a healthy barrier in your colon and helps lower luminal pH, creating an unfavorable environment for the growth of pathogens including molds, yeasts and bacteria. They also said, “While many of our probiotic strains do not have identifier numbers, (meaning strain identification) they are the identical genus and species as strains that do contain identifier numbers but without the high price tag that results from usage in clinical trials and the marketing costs associated with that.” So in other words, the strains are not ones used in clinical trials, and the information they provided about the different species may or may not relate to the strains used in the product. Only the total CFU is given; you don't know how much of each species is present. Here is what Hyperbiotics said when questioned about this: “PRO-15 has an approximately even split between the 15 strains…” so that would mean that each strain is present in about 0.3 billion CFU. The total CFU is at the time of manufacture, not at expiration, so you don't know if you are really getting the amount listed on the label by the time you finish the bottle. However, stability studies at room temperature on 3 different lots of the products showed that after 18 months approximately 55% of the microbes were still viable. Hyperbiotics told me that by 18 months after the date of manufacture, their formulas contain about 40% of the initial CFU count. They are in the process of updating all of their labels to list the guaranteed dose at time of expiration (November, 2015). Since neither the strains nor the amounts of each strain are listed, it is not possible to predict what effects on promoting the balance of beneficial flora on a daily basis or repopulating your probiotic colonies this product will have. This supplement may contain trace amounts of the milk protein casein. Allergy alert! Hyperbiotics PRO-15 also contains FOS, a carbohydrate prebiotic to support the growth of the microbes, which may pose problems for some people even though it is at a small amount of 25 mg per tablet. As with most probiotic supplements, this one should be kept below 70 degrees F which usually translates into refrigeration after it is delivered. Compared to other multi-species probiotic supplements, this one contains a lower number of total CFU of 5 billion per capsule. Assuming it delivers 15 times more probiotics to the intestines than plain vegetarian non-encapsulated supplements as the in vitro simulated digestive system tests showed, Hyperbiotics says that their 5 billion correlates to 75 billion CFU of other products. However, it is still a low number of CFU and many probiotic supplements on the market either have encapsulation to protect the beneficial bacteria or utilize strains that survive passage to the intestines. To be fair, Hyperbiotics said that they are running new studies on their entire line as of November, 2015, and will update me on the results. I will update this webpage if/when I receive a reply. Where to Find Hyperbiotics PRO-15? Hyperbiotics sells each of their products on their website, but they also sell them via their online stores in the Amazon Marketplace in the US, in Canada and in the UK. To buy from Amazon Canada, click here. To buy from Amazon UK, click here. Is Hyperbiotics PRO-15 the Right Supplement for YOU? Without me knowing your health history, only you can decide if this probiotic supplement is right for you. Although it has mostly good reviews, 10% of customer reviews on Amazon.com were for one or two stars, so it doesn’t work for everyone. But then, what does? 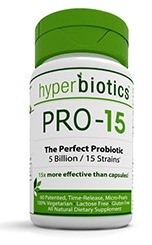 Hyperbiotics PRO-15 has "safe" species of Lactobacillus, Bifidobacterium and Streptococcus, has a nice delivery system, has shelf-stability in transit and is free of most allergens. It also does not use plasticizers to protect the microbes. Nonetheless, I personally would not consider this supplement “The Perfect Probiotic”. Thanks to Jany and Jean for suggesting a review of this supplement! and consider nutrition therapy to get help with your health problems.